Getting a real feel for what it’s like to live on any of Hawaii’s islands is best accomplished through the eyes of the locals, who have special insiders’ knowledge of the best-kept secrets of each. While there are six major islands that can be visited in Hawaii, as few as two percent of visitors head to Molokai or Lanai. If you’re planning a holiday to one or more of the four most popular islands, here is a look at what you should know to make the most of your trip. Hawaii’s Big Island, sometimes referred to as Orchid Island, offers a vast variety of adventures that are quintessentially Hawaiian, including a little something from each of the islands—from long white sand beaches, rainforests and waterfalls to colorful exotic flowers and brilliant birds. The Big Island is so vast that it actually contains 11 of the world’s 13 climate zones! Hawaii is easy to navigate by car and with a little planning, you can drive around the entire island in just a day. Renting a car is preferable to hiring a tour guide. With a guide, you’ll often be forced to move along quickly at the most fascinating destinations while lingering too long at those aimed to part tourists from their hard-earned money. You don’t even need four-wheel drive to navigate most roads. Generally, a basic compact car will do just fine. The Hilo Farmer’s Market is a very popular destination and far better for browsing and buying than the island’s pricier shops. By arriving early, you might be able to grab something especially unique from among the fresh produce, like the exotic jaboticaba fruit. It’s also a good place to find handmade items and clothing, as well as fresh seafood. South Kona Fruit Stand, just south of Kona on Mamalahoa Highway, is one of the best on the island. The produce comes from the organic farms next door. The excellent selection includes sweet strawberry papayas, as well as chocolate-covered macadamia nuts—perfect for your next scenic drive. When packing, you’ll probably be thinking about skimpy clothes and bathing suits. However, if you plan on visiting the observatories atop Mauna Kea, you should know that even in this tropical paradise, temperatures can get below freezing at 13,800 feet elevation. Be sure to bring a warm jacket, long pants and thick socks. Maui County is comprised of four islands that provide shelter by forming a protected basin. This basin is very shallow compared to the one- to three-mile ocean depths normally seen in the deep Pacific. With virtually no predators in these waters, it’s a haven for North Pacific humpback whales. In the wintertime, they can even be seen from the shores. Makena Beach offers one of the best spots to see them in crystal-clear water. If embarking on a sunset sailing cruise sounds uber-romantic, watching the sun go down from the shore will provide the more tranquil, intimate experience you’re looking for. If you decide to board a catamaran instead of staying on shore, you’ll soon realize that you’re sailing back and forth just a few hundred yards from the beach and will probably be squeezed in like a sardine with the other tourists. In addition to being a great spot for whale watching, Makena on Maui’s south end is a wonderful beach for sunsets, as is Napili on the west side. The Road to Hana should be a must on your to-do list. This spectacular 55-mile drive is more about the journey than the destination. Smell the aroma of guava and ginger while exploring an endless number of beautiful beaches, along with basalt-lined pools and cascading falls among ultra-lush tropical scenery. Some travelers forget that the surf throughout Hawaii can be especially rough. Experienced surfers will enjoy the challenge of the waves at Hanalei Bay, but beginners should head to Kalapaki Beach at the Nawiliwili Harbor, which has shallow left and right sandbar breaks. In the winter months, the surf can be treacherous—only go into waters that are protected by a reef. Locals know the most beautiful beach on the entire island is found at the end of the road on the north shore, at the far northern end of the Napali coast. Ke`e Beach’s gentle ocean lagoon is at its best in the summer when calm conditions prevail, making it an ideal spot for snorkeling. Those who plan to enjoy the nightlife in Hawaii are best served by heading to Oahu, the home of the state’s capital, Honolulu. Honolulu is the 11th largest city in the nation and is spread out along five miles of ocean shoreline. Here you’ll find plenty of trendy nightclubs and fantastic eateries with much of the culture you’d expect to experience in any big US city. Waikiki Beach is the place to go if you want to see and be seen while experiencing the center of resort energy. If you want to get away from the crowds and experience amazing snorkeling in a more remote area, try Hanauma Bay, where snorkelers can swim alongside some of the world’s most brilliantly colored fish. On calm days, Ka`ena Point State Park offers an especially remote experience along its rock-strewn coastline, with a sandy beach area perfect for entering the water. When the currents are too strong, visitors can take a 2.7-mile trail that passes tidal pools and natural stone arches along with breathtaking views of the coastline. For trusted Hawaiian tours, activities and adventures, be sure to check out Tom Barefoot’s Tours. Since 1975, they have been the trusted way to book fun activities in Hawaii. They even have a low price guarantee, so you know you’ll save when you book with them. 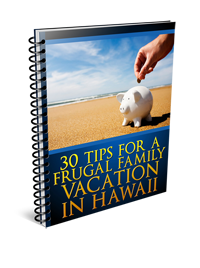 Save your money for mai tai cocktails! This is text which you can edit to suit. It's designed to help entice visitors to sign up and you can change it. ©2019 Hawaiiify. All Rights Reserved. 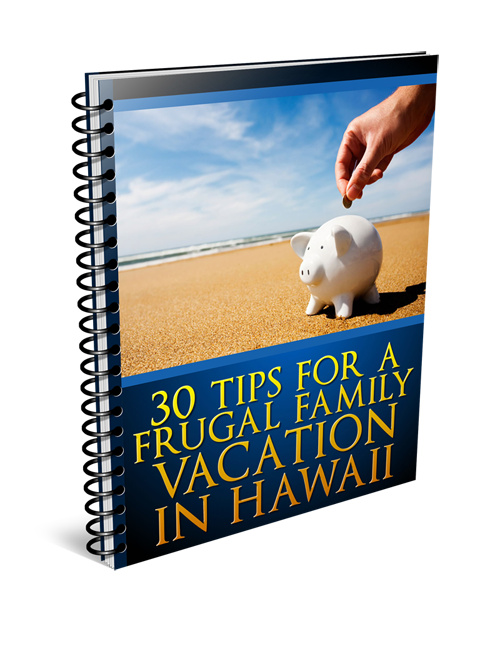 30 Tips for a Frugal Family Vacation in Hawaii!